Stanyslaviv eparchy [Станиславівська епархія; Stanyslavivska eparkhiia]. An eparchy of Halych metropoly created from the eastern part of Lviv eparchy, with its see in Stanyslaviv (now Ivano-Frankivsk). Although initial requests by Metropolitans Antin Anhelovych and Mykhailo Levytsky to establish the eparchy were approved by the Austro-Hungarian authorities and the pope as early as 1850, it was only in 1885 that Yuliian Pelesh was ordained and enthroned as the first bishop of Stanyslaviv. He was succeeded by Yuliian Kuilovsky-Sas, Andrei Sheptytsky (1899–1900), and Hryhorii Khomyshyn (1904–45), with an auxiliary bishop, Ivan Liatyshevsky (1929–45). By 1939 the eparchy had 419 parishes served by 541 priests, and over 1 million faithful. Various monastic orders were active in the eparchy, especially the Basilians (in 1938 there were 47 Basilian priests and monks, and 48 nuns), Sisters Servants of Mary Immaculate (157 nuns), Myronosytsi Sisterhood (59 nuns), Redemptorists, Studites, Sisters of Saint Vincent de Paul, and Holy Family Sisterhood. An eparchial seminary and a theological lyceum were established in 1906. 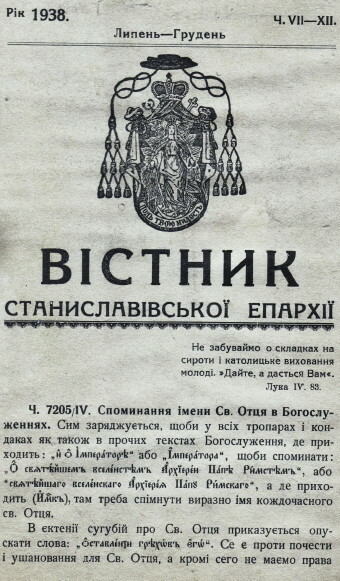 The eparchy's official organ was Vistnyk Stanyslavivs’koï ieparkhiï, published irregularly and then monthly from 1886 to 1939. The eparchy also copublished the religious quarterly Dobryi pastyr. Under Hryhorii Khomyshyn, Stanyslaviv eparchy was the most Latinized of all eparchies of Halych metropoly. He introduced compulsory celibacy for all new priests in the eparchy in 1921 and attempted unsuccessfully to introduce the Gregorian calendar in 1916. His measures led to considerable dissension in the eparchy. After the Second World War the territory of Stanyslaviv eparchy was incorporated into the Ukrainian Soviet Socialist Republic. The Soviet authorities arrested Bishops Hryhorii Khomyshyn (who was killed in a Kyiv prison in 1947) and Ivan Liatyshevsky. The eparchy was forcibly converted to Orthodoxy, and A. Pelvelsky of the Russian Orthodox church was installed as bishop. The Ukrainian Catholic church survived in the underground until 1 December 1989, when it was again legalized. In 1989 S. Dmyterko was formally recognized as the ordinary of the eparchy (called Ivano-Frankivsk eparchy). He was assisted by Bishops Pavlo Vasylyk and I. Bilyk. In 2011 the eparchy elevated to the status of Ivano-Frankivsk archeparchy within the newly created Ivano-Frankivsk metropoly. Volodymyr Viityshyn was wstablished as metropolitan and archbishop of Ivano-Frankivsk. In 2013 the archeparchy had 21 deaneries. 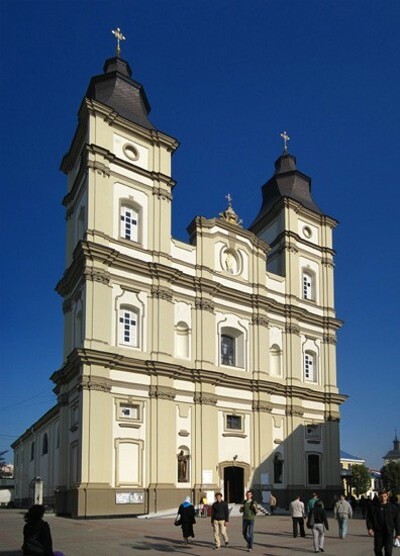 In the early 1990s the renewed Ukrainian Autocephalous Orthodox church established its own eparchy of Ivano-Frankivsk and Kolomyia.